We've got hummingbirds all around our house and have wondered what their nests are like. I'll have to look for them. I hope to see that one at CMV next week! Re: This is SO Cool! I found this one because I saw the mama bird fly behind a branch, but she never came out the other side. So I went to see where she went. 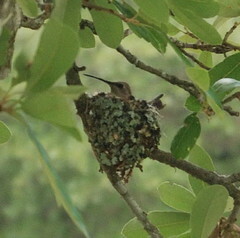 I've heard of two other hummingbird nests on the ranch. They all seem to be about head high at the end of oak tree banches. I am so happy from seeing this picture. Does she not mind all the attention? It's the only time I've seen a hummingbird that wasn't flying or hovering. It's so lovely. Thanks! She seems OK with it. I've put chairs underneath the nest to keep people from hitting the branch the nest is on. To take this picture, I waited until I was the only one in camp. Then I put on my camo pants and jacket. I got about twenty feet away and took a picture. I stood still for a bit and then went two steps closer took another picture and waited. I kept doing this until she flew away. This is the last picture I took. I was about fifteen feet away..
We're trying to give her as much quiet as possible. I've blocked the path, and our neighbor is buying a hummingbird feeder today so the mom will have food close by.